Another data breach from 2012, and this time, it's Russia's biggest internet portal and email provider Rambler.ru. The internet giant didn't deny that it stored passwords in unencrypted plaintext, but suggested that its password security policies are far stronger today. 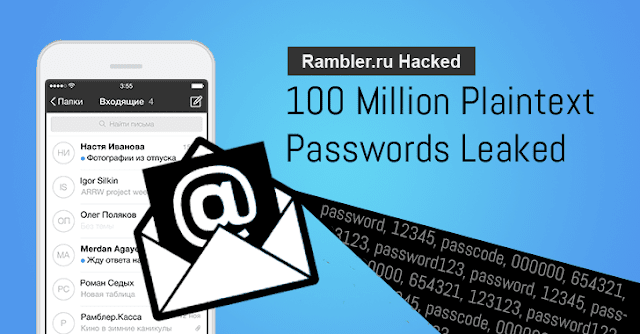 Rambler.ru, also known as Russia's Yahoo, suffered a massive data breach in 2012 in which an unknown hacker or a group of hackers managed to steal nearly 100 Million user accounts, including their unencrypted plaintext passwords. According to LeakedSource, none of the passwords were hashed, meaning the company stored its user's password in an unencrypted plain text format that could allow the company as well as hackers to see passwords easily. LeakedSource has added the data into its database; so Rambler.ru users can check if they have been compromised by searching their account at Leaked Source’s search engine.Rambler.ru is the latest victim to join the list of "Mega-Breaches" revealed in recent months, when hundreds of Millions of online credentials from years-old data breaches on popular services, including LinkedIn, MySpace, VK.com, Tumblr, and Dropbox, were exposed online says Manan Shah - CEO, Avalance Global Solutions.